Cycling is an industry of constant development for faster, lighter and stronger products, we’re always trying to reduce weight to go faster, so why not your shoes too? We’ve seen some brands make a point of this and develop some truly lightweight options for their riders. Last month I cashed in on some Lake CX301’s, the ultra lightweight climbing shoe by Lake. Those that know me might be sitting here thinking, why does Waino (who tips the scales at 69kg’s when wet) need to drop any more weight? We’ll, keep reading to see my motivation behind this purchase and why I’ll be racing in these shoes for my next race. 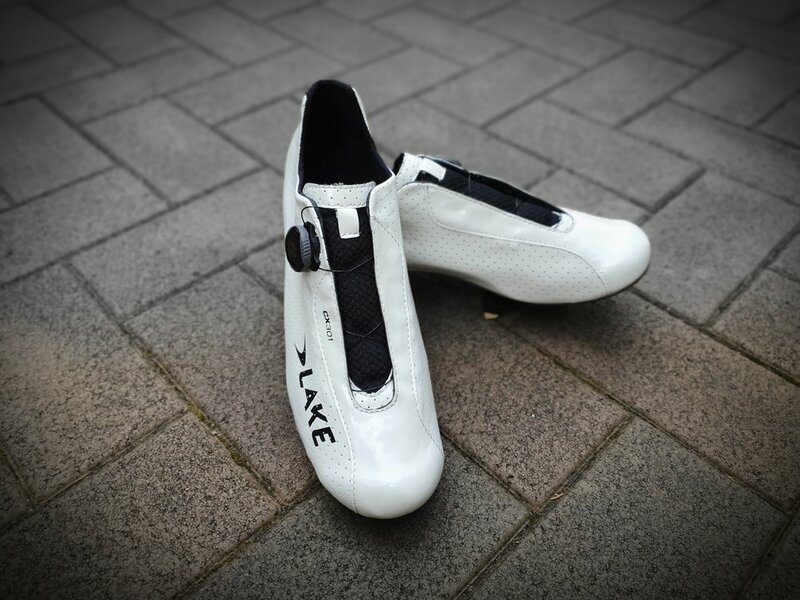 I have 3 pairs of Lake shoes already, they’re a great brand producing quality shoes, with a big range to meet many cyclists needs. I try not to think of myself just as a ‘triathlete’ as I love road cycling and riding in groups, but my motives for testing this shoe definitely fall into the ‘triathlon’ category. As much as I’d like to claim I need a lightweight climbing shoe for my road riding, I chose the Lake CX301’s as a potential long distance triathlon racing shoe due to their fast closure system, soft breathable upper and limited weight. Out of the box the shoe looks narrow, actually very narrow. I have a narrow foot so I opted for the regular version, especially as when I race triathlon I won’t wear socks. Surprisingly, they don’t fit as narrow as you might think. Some of the custom fit, top end Lake road shoes that have the full carbon chassis, which has a rim that sits up a fraction from the sole, this gives the shoe more shape and support (and customisation), the CX301 doesn’t have this. This allows for the soft upper to have some give and ultimately spread out a little when your foot is inside so they don’t feel as narrow as they look. To compliment this the toe box also has a good amount of depth so you never feel like your foot is being squashed too much from the side or the top, but remember I do have a narrow foot, and there are wide and extra wide options if you need them. There is not a lot of padding at the rear of the shoe around the heel, again this is where weight gains are made and although the tongue is quite thin, again shaving weight, it is padded and quite soft. So far I’ve not had any experience with negative pressure on the top of the foot, even with no socks, which is always an initial winner in my book! Although purchased for triathlon racing I have been working hard to break these shoes in across multiple rides indoors and on the road, with and without socks (not on the road without socks - cringe worthy) . The concern with riding such a light shoe is always going to be the support or stiffness the shoe might lack, lightweight often comes with a trade-off. The CX301 is super comfortable out of the box, fits my foot well, but how would they fair on the hills of Mosman, without socks in a triathlon setup and most importantly at the post ride coffee shop interrogation by the riding group? Like with all top end Lake shoes, the carbon sole is fantastic, super stiff, has two ventilation areas and they look mint! For a light rider like me the CX301 provides me with plenty of structure to output enough power to get over the hills, in full aero triathlon mode on the flat and to back to the coffee shop on time. You can absolutely feel the difference in the shoes weight when riding, with a light shoe, higher cadence riding definitely seems a little bit more achievable. Where I think some riders will struggle with the CX301 is it’s upper. It looks great, it’s breathable and light, but it does lack a supportive structure that you find with other top end road shoes. Structurally they feel different to my Lake CX402, Giant Surge Pro or Shimano S-Phyre, although different doesn’t necessarily mean worse, they just feel different. What I do suspect is that if you are looking to buy a very light cycling shoe, support is your biggest trade off, which is what I assumed before I tried the shoes. The CX301’s always felt secure on my foot, the risk with a single BOA closure is often that the shoe is not tight/loose enough in the right places, but even without socks I had no issues with securing the shoes to my liking (but again a good fit helps). The heel cup is another area that I think could potentially cause issue for some riders. The lack of structure and padding in that area might lead to a little bit of ‘slippage’ and a feeling of less support (especially if you have achilles issues), not the deal breaker for me as the narrow heel fit me well, but something to consider, especially if the fit is not perfect for you. Well obviously I did buy and I’m not disappointed! As I mentioned at the start, this shoe was bought with a specific purpose and its fulfilling that for me so far (I’m yet to race in them). While weight gains might not be at the forefront of every riders cycle shoe specifications, the CX301 is definitely the lightest shoe I’ve ridden and noticeable each time I put them on. As an every day cycling shoe I’m not sure they will be on the top of your list, but where these shoes come into their own is for those days where you want to feel light and fast! For a tour rider you’ll see them strap these on in the mountains, for me, it’s triathlon race day.